Introducing a new puppy to your home can be an exciting and challenging time. Remember, they are cute for a reason! Puppies are babies, and they require extra care. Use the following tips to make your new family member’s transition into your home as smooth as possible. Make sure you have done your research! Know about the breed you are bringing home and learn a little about puppy training and socialization before your little one comes home. Prepare any children in the house for taking care of a puppy. They should know on an age-appropriate level about basic care and how to handle the new dog. There are many resources geared towards children to help you teach them about their new pet. Pick a potty place! You are going to be spending a lot of time here over the next few months. This should be the first place your pup visits when he or she gets home. Come and see us! A new puppy should be examined within 24-48 hours of coming home so that potential health problems can be addressed and any questions regarding care and training can be answered. And don’t forget that we offer this first exam, an intestinal parasite evaluation, and your puppy’s first shot all for free! 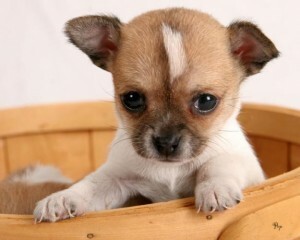 Puppies need to be kept safe and relatively contained. Purchase a crate, baby gates, or any other items needed to help you keep close tabs on your pup. Puppy-proof the house. Objects that you don’t want to be chewed like plants, electrical cords, and other doggy dangers should be secured. Get down on your hands and knees and think like a curious pooch! Buy the basics. Your pet should have a few toys that are suitable to chew on, a leash, collar, and identification tag, and bowls. Have a week or two of the food it has been eating so that you can transition over to any new diet over the course of 7-14 days. Prepare existing pets. Be sure that they are healthy and up to date on any medical needs. 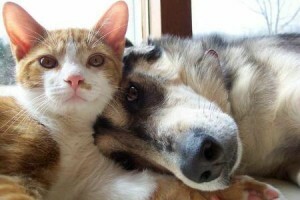 Cats in particular may appreciate a “puppy-free” zone where they can seek shelter. Congratulations on your new pet! By laying the foundation for a good start, you are helping to ensure a long and healthy life! Check out the pet care handouts on our website for some more puppy tips and tricks. If you have any questions please don’t hesitate to call us. … salt products used to melt ice can be very irritating to delicate paws and some are even toxic? Use pet-friendly ice melting products for your sidewalks and driveway and be sure to wipe your pet’s tootsies and underside when they come in after a walk. … anti-freeze is lethal to pets even in tiny amounts? This sweet tasting liquid causes rapid kidney failures. Notify neighbors if you notice a leak in their driveway and use a pet-safe alternative for your own vehicles. … many a chilly kitty has taken refuge on a warm engine block. If you do not park in a garage, bang on the hood of your car to scare off any stowaways before starting your engine to avoid an unwitting animal becoming injured under your hood. … pets can get frostbitten too! While many do sport a warm, furry coat, they should not spend a substantial amount of time outdoors in subzero temperatures without shelter. 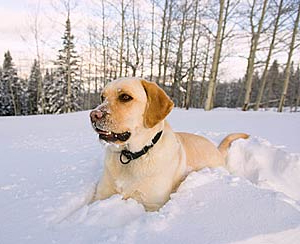 Thinner coated pets might benefit from a warm coat and/or booties as well. … very young or elderly animals may not tolerate the chilly weather as well others? Use common sense when taking these animals outdoors this winter. … cats should be kept inside whenever possible in the winter? The dangers of being outdoor increase substantially for kitties when the temperatures plunge. … dogs can lose their scent in the snow? A dog that panics off leash in a snow storm may not be able to find it’s way home like it would normally. Keep your dog leashed. As always, please call us if you have any questions about keeping your pet safe this winter. Everyone wants a puppy or kitten… right? The truth is that taking on a new family member is a huge responsibility, and not everyone is up to the commitment. While the image of a little furry friend sitting under the Christmas tree may be irresistible, giving a pet as a gift is a very serious matter. With 6 to 8 million dogs and cats entering shelters every year, selecting a pet that is right for an individual family and situation is of utmost importance. Because having a pet is a decision that an owner must be committed to for the pet’s entire life emotionally, financially, and physically, the selection of an animal is usually best left to the individual taking on the responsibility. The holiday season is often not a good time to introduce a new family member, either, as new pets take extra time and attention often not available during this busy season. Please think carefully before giving a furry gift, and certainly do not do so without discussing extensively with the recipient. Or, if the surprise is a big part of the gift, consider giving a gift card to a local rescue or animal shelter that will cover the adoption costs. That way the recipient will still have the surprise of a new pet, but will also have the ability to pick one out that suits his or her lifestyle and personality. November was Pet Cancer Awareness Month, and although we’re now into December, we wanted to be sure to address this important topic. The good news: Our pets are living longer than ever thanks to advances in medicine and better overall standards for care. The bad news: Just like in people, the longer a pet lives the more likely it is to be affected by cancer. In fact 1 in 4 pets will die of cancer. But all hope is not lost. By following these tips you can help catch problems in your pet early as well as take actions to try to minimize the risks of your pet developing cancer. Keep those appointments. Annual or semi-annual vet visits allow us to perform a thorough examination and lab work as well as time for us to discuss any new concerns that you might have. These visits are an important step in stopping cancer in its tracks. Know your breed. Did you know that certain breeds of dogs and cats are more prone to certain types of cancers? While any breed can develop any kind of cancer, knowing what body systems would most likely be affected can tip you off to problems early on in the process. General signs of a problem can include weight loss or behavior changes, among other things. If it’s bad for you it’s bad for your pet. Substances that are known to cause cancer in people likely can lead to cancer in our pets- think cigarette smoke, asbestos, and herbicides. As if you needed another good reason to give up smoking! Spay or neuter! Spaying your dog or cat greatly reduces her risk of mammary cancer (among other health issues) and a pet that is neutered can’t get testicular cancer! What’s good for the goose… We’ve all heard it a million times over. Eat right and exercise. Good quality nutrition and a healthy weight are important factors in reducing cancer risk. While cancer is a formidable foe, it is not unbeatable. By working with us as a team, you can help identify problems early, making your pet’s prognosis much more favorable.